NEWCASTLE UNITED TICKETS SEASON 2018/2019. Newcastle United Football Club has a huge fanbase. Newcastle Utd set the attendance record for a Championship game, with a crowd of 52,181 present in their final home match of 2 seasons ago against Ipswich Town on 24 April 2010. 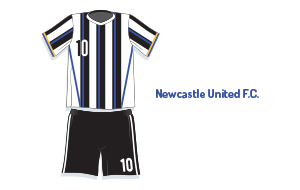 Newcastle United have won an impressive 6 FA Cups and in 2006 they won the UEFA Intertoto Cup. The upcoming season Newcastle Utd will do everything in their power to show the world that the club deserves to play in the English Premiership, one of world's toughest football leagues. Newcastle United 2018/2019 fixtures have been announced. Buy Newcastle United tickets securely online through our secure booking system. Newcastle United will have a decent squad to be a serious opponent for any team. Not only we have Newcastle tickets available for 2018/2019 Premiership matches, but also we offer Newcastle United Fa Cup tickets and Newcastle United Capital One Cup tickets. 1st4 Football Tickets sells Premiership Newcastle United tickets for home and away matches. See Newcastle United playing at the spectacular St James Park stadium! You can either buy your Newcastle United football tickets online through our secure online booking system. Newcastle United vs Chelsea Tickets - Newcastle United vs Tottenham Tickets - Manchester United Tickets vs Newcastle United Tickets - Newcastle United vs Liverpool Tickets.